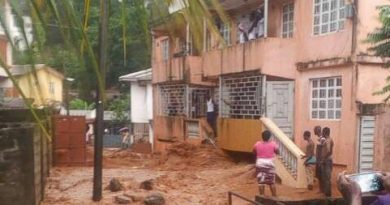 A fast-moving wall of mud, loosened by heavy overnight rains, has buried over 300 Sierra Leoneans, many of them sleeping children, during a torrential downpour early Monday. The deluge was foreseen by climate change experts. Videos posted by local residents show an angry flood of dark orange mud rushing down a steep street in the capital. In some shots, people waist and chest deep in water are seen desperately trying to cross the road. Early estimates put the number left homeless from the hilltop area of Regent at 2,000 while over 100 properties at the foot of Sugar Loaf mountain were reported submerged or collapsed before sunrise, said the Red Cross. Residents of the Kaningo neighborhood on the west side of the capital Freetown were seen collecting the dead even as floodwaters had yet to recede. The neighborhood was among the hardest hit by rampaging floodwaters, which washed away a bridge and left homes caked in mud and debris. Two years ago, a member of the Africa Research Institute, Jamie Hitchen, investigated the country’s flood cycle and its impact on the 61 or more unplanned settlements, many of which are perched on the farthest land masses before the sea. “Kroo Bay, one of the largest coastal slums with an estimated population of 6,000, has flooded every year since 2008”, Hitchen observed. “The floods were not unexpected,” Hitchen maintained. Increasingly frequent floods disproportionately affect those living in “at risk” communities. A recent report by the USAID Climate Change Risk Profile highlighted the country’s environmental threat. “Sierra Leone faces multiple risks from climate change that threaten key economic sectors and increase the potential for wider environmental degradation. Meanwhile, a hydroelectric power plant that promised to “light up” Freetown has barely delivered the much-needed 60MW of power intended. This month, a UK company has taken over construction of Bumbuna II, a second power plant. Estimated year of completion: 2030.